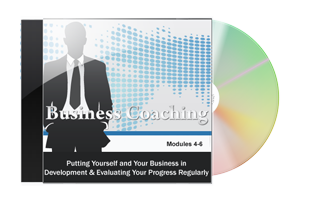 Your Online Resource for Business Coaching Certification! Whether you're already running a successful business and want to develop the ability to teach and coach others or you are brand new to business, this course will provide you with everything you need to run a successful business coaching operation. Q: Will I be properly trained if all I take is your online Extreme Business Success Coaching Certification program? A: Ideally an Extreme Business Success Coach would be trained in a classroom setting with an instructor physically present. Unfortunately, this luxury is not practical for many people. When we factor in airfare, hotel, time away from work and family, etc. the costs both monetary and otherwise quickly add up. For this reason, many institutions have turned to online training as a viable alternative to meeting modern day needs. In fact, Columbia, Harvard, and Cornell have extensive online programs. Also, Penn, Dartmouth, and Yale offer online classes. Dr. Steve G. Jones, while working on his doctorate in education, extensively studied the online programs offered by Ivy League schools. He then was able to model the NLP training program to offer a similar level of training. Additionally, In this course, you are encouraged to find a study partner and to practice your techniques on a number of people. Q: What Do I get When I Buy the Extreme Business Success Coaching Certification Course? A: It takes about 2-3 weeks if you move quickly by studying the material on a daily basis. A: The test is included in the course materials and you simply complete the test after all other modules to get your certification. A: We will send your certification as soon as possible once we have reviewed your test materials and given a passing score. A: Upon completion of this program, you will receive a beautiful certificate sent via email, which you can print out and proudly display for your clients to see. 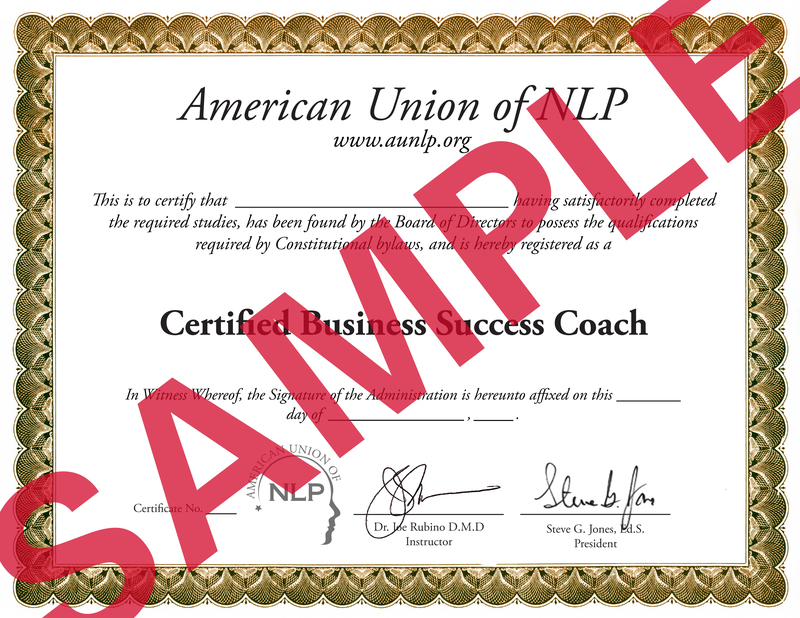 It will have your name, title (Certified Extreme Business Success Coach), and your certification number. Q: What are Dr. Steve G. Jones's and Dr Joe Rubino's qualifications as instructors? A: Dr. Steve G. Jones has over 20 years experience as a certified clinical hypnotist, both teaching hypnosis students and working with clients. His list of former clients includes: Danny Bonaduce, Jeraldine Saunders (creator of the Love Boat TV series), Tom Mankiewicz (writer of Superman the movie), and many other celebrities. Dr. Steve has served on the board of directors of the American Lung Association in Los Angeles, California. He is a member of the National Guild of Hypnotists, National Board of Certified Clinical Hypnotists, founder of the American Alliance of Hypnotists, member of the International Registry of Clinical Hypnotists, has presented his hypnosis research at the American Council of Hypnotists Examiners, received the President's appreciation award for his outstanding contributions to the American Association for Adult and Continuing Education, is a member of the American Board of Hypnosis, member of Who's Who among Students in American Universities and Colleges, member of Pi Lambda Theta International Honor Society and Professional Association in Education, member of Omicron Delta Kappa Honor Society, member of the Golden Key Honor Society, recipient of the National Leadership Award from the United States National Congressional Committee, received a bachelor's degree in psychology from the University of Florida, received a master's degree in education from Armstrong Atlantic and State University, received the educational specialist degree from Georgia Southern University, and is currently a doctoral candidate in education at Georgia Southern University. Dr. Steve has recently been featured on TruTV, CNN, and is under a development contract for his new television series on hypnosis. 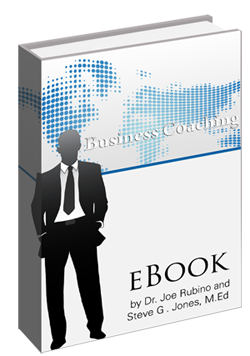 Dr Joe Rubino is an internationally acclaimed expert on the topic of self-esteem, a life-changing personal development trainer and success coach and best selling author of 11 books and multiple audio sets and videos on topics ranging from how to restore self-esteem, achieve business success, maximize joy and fulfillment in life and productivity in business. An acclaimed speaker and course leader, he is known for his groundbreaking work in personal and leadership development, building effective teams, enhancing listening and communication skills, life and business coaching and optimal life planning. Q: Does the American Union of NLP help its trainees by promoting them online? A: Yes. You will be listed on the International online list of Certified Extreme Business Success Coaches. Q: I am a layman with no Business or Coaching background. Will this program actually take me from the ground floor up and teach me everything I need? A: Yes. This program is extremely thorough and it will teach you everything you need to know to be a certified Extreme Business Success Coach and help you run your own practice. Upon registering, access to the entire program will be sent to you via e-mail. You can work at your own pace. You will perform the practical homework and will submit your exam online for grading. This training curriculum will include 2 hours of video from Dr. Steve and Dr. Joe, 2 hours of screencast presentations and 6 hours of audio from both Dr. Steve and Dr. Joe. The 10 hours will be subdivided into 30 modules consisting of 20 minutes each.